If there are wrong DNA pair, for example A=G, is there mechanism that could repair such things - after the replication was finished? Or it happens only during replication? DNA mismatches and indels can be repaired after replication through an aptly named mechanism called DNA mismatch repair. I'll briefly describe the mechanism in Escherichia coli, but it's similar in other organisms. A protein called MutS scans DNA for lesions caused by mismatched nucleotides incorporated during replication that escaped DNA polymerase proofreading. These are detected by the kink they produce in the DNA backbone. MutS recruits MutL and MutH; the former activates the latter, which is an endonuclease. 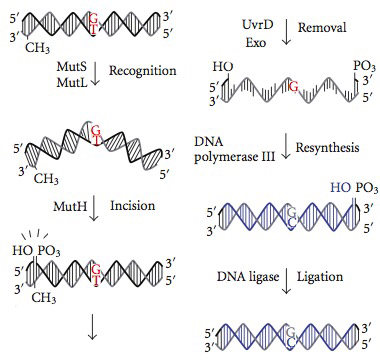 MutH cuts the DNA backbone near the lesion in the newly synthesized strand (the one containing the misincorporated nucleotide). This strand can be identified because it has not yet been methylated, while the parent strand contains the original methylation. After cleavage, UvrD helicase unwinds the strand and an exonuclease digests it. The gap around the former lesion can then be filled by DNA polymerase III and DNA ligase. Why do some bacteria have an asymmetric replication?